No phrase is more associated with the three-decade rule of Ali Abdullah Saleh than “dancing on the heads of snakes”, his description of what it took to rule Yemen. Over the coming hours, as obituaries are written for the man who in essence created the situation of Yemen today, that phrase will be used more than any other. It is somehow fitting that Saleh will be remembered for a phrase that he himself used to describe his own political success. In a country ruled by one man for so long that the majority of Yemenis can remember no leader before him, what is objective history and what is self-serving propaganda can be hard to distinguish. To millions, Saleh was a hero; to millions more, a villain. Repeatedly, across the decades, he flitted between these two roles. That was his method of control. To maintain his power, Saleh played off groups against each other, always seeking to place himself in the center of disputes, the only man who could bring the warring sides together. To millions, Saleh was a hero; to millions more, a villain. Repeatedly, across the decades, he flitted between these two roles. But if Saleh was frequently the last man standing, that was only because he systematically sought to undermine any institutions that would have allowed Yemen to function as a state. It was Saleh who broke apart the bonds of Yemen's civil society; who, by impoverishing the country, divided and destroyed communities; who siphoned so much of the country's wealth into his hands that young people, hungry for education and development, saw no option but to seek a future outside the country, or else dream of little else than living another day. It was Saleh who made sure that Yemen's parliament was dominated by one party – his party – and that the army was loyal to no-one else but him. If he spent his life dancing on the heads of snakes, it was only because he sought to crush them beneath his feet. Yemen is often said to be a country where familial and political allegiances matter – a tribal country, in other words – but Saleh's long rule exacerbated that. Yemen today is arguably more divided, more tribal, than it was in the 1980s, in the early years of Saleh's presidency. The fault for that has to lie, in significant part, with Saleh himself. After he became president of North Yemen in 1978, he began using the country's money to buy off tribal confederations, bypassing the fledgling parliament. He divided communities across the north, offering money for infrastructure projects in one area, while offering protection to communities in others. That technique proved so successful that he was re-elected president twice more. After the unification of north Yemen with the socialist south in 1990, he used the same methods. Instead of bolstering the institutions that could stabilize the union, Saleh systematically sidelined the south, handing important political and military positions to northerners who backed him, and ensuring that the south, historically the richer part of the union, fell into economic decline. That tendency only exacerbated after the secession of the south in 1994 was stopped by the north's army, ushering in a long period of marginalization and decline. “An occupation” was how southerners saw it and Saleh, for the best part of a decade, did little to ally their suspicions, fueling the separatist desire. But it wasn't only the south that he marginalized. In the capital Sanaa, the political party he founded, the General People's Congress, swallowed all opposition, using a mixture of intimidation and patronage. In three decades, there was never an election in Yemen that the GPC did not dominate. That political control ensured his survival, even as his political decisions impoverished the country. By backing Saddam Hussein during his invasion of Kuwait, Saleh infuriated the Gulf states, who responded by expelling over a million Yemeni workers. At a stroke, remittances, a vital part of the household budget for millions of families, vanished. Seeing the economic devastation, Saleh could have relented, but on this principle he held firm. Even as the country's oil reserves dwindled and in some areas water became scarce, he refused to mend relations with his neighbors. It was the years of the “war on terror” in the 2000s, when Islamist militias found their way to the ungoverned spaces of Yemen, that rehabilitated his relationship with the outside world. Millions of dollars flowed into Yemen from the United States and its allies, but little seemed to trickle down to developing any institution except the army. The tensions in Yemeni society did not go away and finally erupted during the Arab Spring, in 2011. Millions took to the streets to protest Saleh's rule, in the largest demonstrations seen in any Arab country. Those who had been most marginalized by Saleh's years in power, in particular the youth, the southerners and the Houthis in the north, became the driving force behind the protests, pushing with the momentum of history. Under intense pressure, even his closest allies began to desert him. Once again, however, Saleh reached back to what had been his trump card, seeking to persuade tribal alliances that he was their best chance of keeping their privileges. Assuming that he had lost the south, he distributed hundreds of thousands of dollars to northern tribes, seeking to keep them onside. But still, long-standing ties, such as that between him and powerful members of Hashid tribal confederation, frayed. The Gulf Cooperation Council stepped in to offer a transition deal and Saleh – eventually – stepped down, in return for immunity. That should have been the end of the story and for most politicians it would have been. But Saleh's power to rule by division found one more opportunity. Armed forces still loyal to him backed the northern Houthi rebels, who swept into the capital in 2014 and provoked the latest crisis. When Saudi Arabia led an Arab coalition to restore Abdrabbu Mansour Hadi to the presidency, Saleh's allies and the Houthi forces fought hard, devastating the country. Then, just days ago, Saleh signaled what observers of Yemen had long expected: another twist, a sudden break with the Houthi rebels. “We will turn a new page,” he said in a television interview at the end of last week, addressing the Gulf states. But for Ali Abdullah Saleh, this throw of the dice proved to be his last; after so many years dancing on the heads of snakes, one of the snakes finally reached up and bit him. 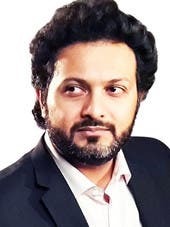 Faisal al-Yafai is an award-winning journalist, essayist and playwright. He has been an investigative journalist for The Guardian in London and a documentary journalist for the BBC. Al-Yafai has reported from across the Middle East, from Eastern Europe, Asia and Africa. He served as a Churchill Fellow in Lebanon and Indonesia. A well-known public speaker, al-Yafai is a frequent guest on television networks such as CNN, the BBC and France 24. He can be followed on Twitter @FaisalAlYafai. 886 Shares France asks: Should Notre-Dame’s spire be rebuilt as it was?